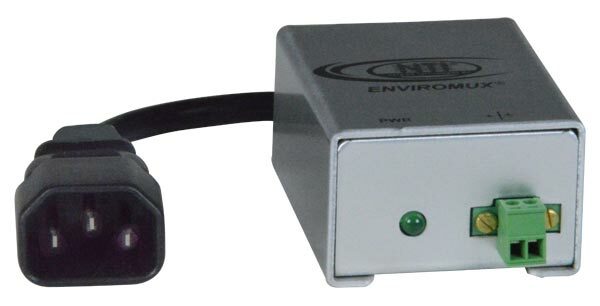 The ENVIROMUX® AC Voltage Detector with Relay detects voltage from 50VAC to 250VAC when connected to an environmental monitoring system with dry contact inputs, battery, sensor, or other device. The internal relay closes when sensing voltage above 60VAC and opens when sensing voltage 55VAC and below. The ENVIROMUX® AC Voltage Detector with Relay detects voltage from 50 to 250 VAC when connected to an environmental monitoring system with dry contact inputs, battery, sensor, or other device. The internal relay closes when sensing voltage above 60 VAC and opens when sensing voltage 55 VAC and below. Monitors the presence or absence of AC voltage, 50-250 VAC. Supports 2-wire sensor cable up to 1,000 feet (305 meters). Available with a standard US 120V 10A NEMA 5-15 plug or universal 250V IEC C14 socket. Sensors, such as: strain gauge, pressure transducer, RTD, thermistor, thermocouple, piezo electric sensors, photoresistor, industrial accelerometer, any kind of variable resistor, and any kind of sensor that outputs a voltage. Measurement range: detects mains voltage from 50 to 250 VAC. Measurement indication: Alarm or Normal. Sensor type: open/closed contact switch. Includes 6-foot (1.8-meter) 2-wire cable to connect to an environmental monitoring system. E-ACVDRLY-515: Standard US 120V 10A NEMA 5-15 plug on attached 5.5-foot (1.67-meter) cord. E-ACVDRLY-C14: Universal 250V IEC C14 socket on attached 6-inch (0.15-meter) cord. Storage temperature: 32 to 158°F (0 to 70°C).